A 5-part series that looks at some different aspects of the planning, and the professionals, that helped to make Sophie and Chris’s Wedding Ceremony a unique and memorable occasion. 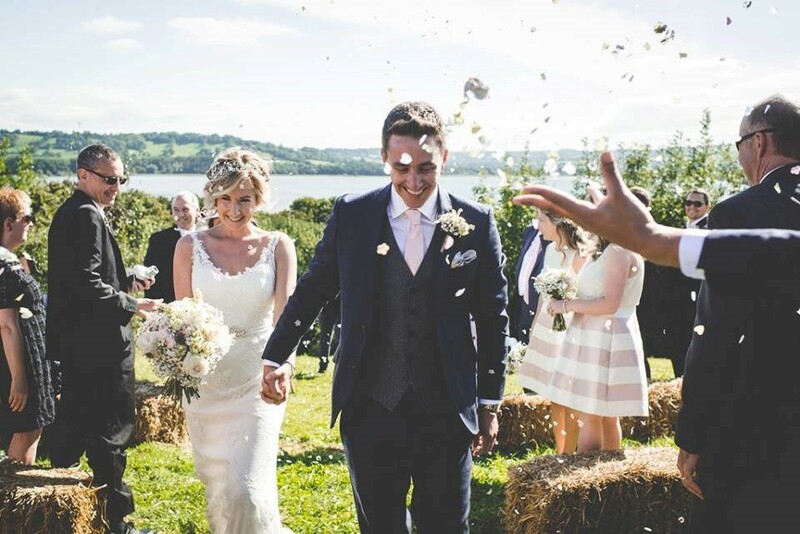 As a wedding celebrant, I am very aware of all the different elements that blend together to make your wedding day perfect. Wedding flowers and decorations play an important part in uniting these elements. 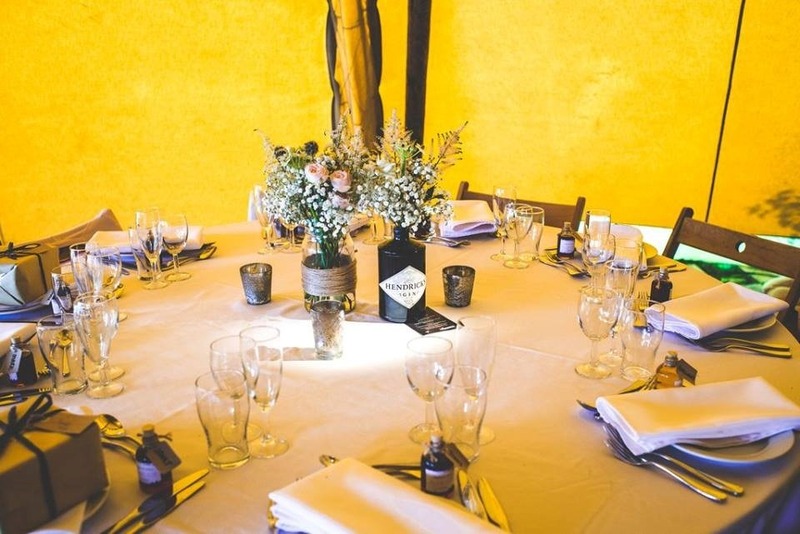 Sophie wanted to enhance but not overwhelm the natural simplicity of the tipi setting and the surrounding countryside. A light touch, nothing too heavy, stiff or formal was needed on the flowers and decorations for the wedding celebrations. Soft pink has always been her favourite colour and it goes without saying that it would be in her bouquet. 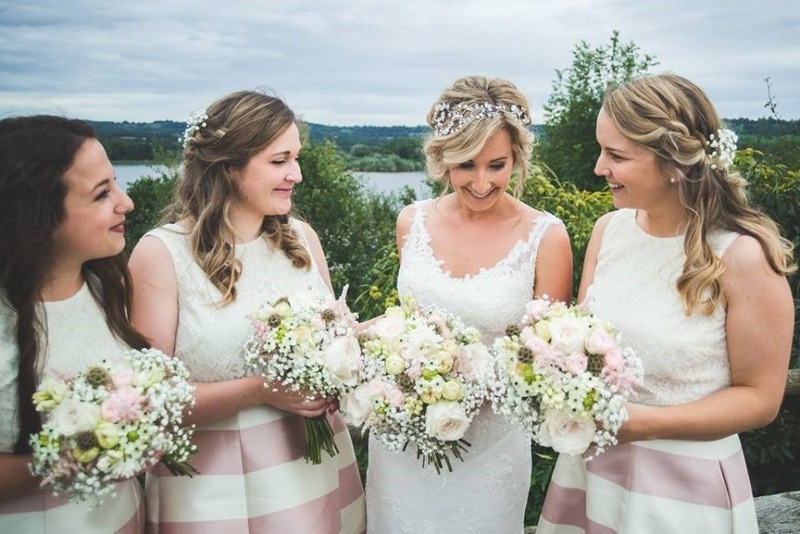 All the wedding suppliers that Chris and Sophie had chosen were local to the area, and they wanted to ensure that the flowers were also from a supplier who wasn’t overly commercial, and who offered a small, personal and bespoke service. Having researched lots of florists in Bristol, they found Claire at thewildebunch.co.uk. 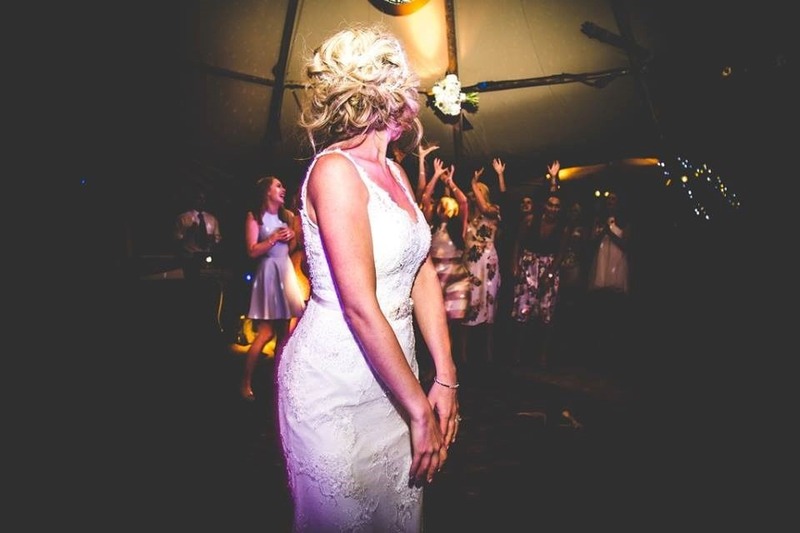 Claire is based in a barn on the outskirts of Bristol. When Chris and Sophie pulled up to the remote farm buildings, they were welcomed by her huge dog, Boots. 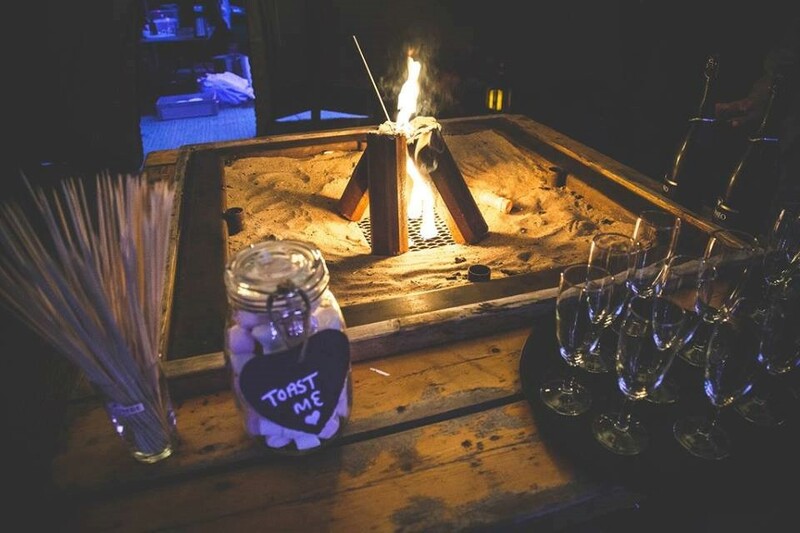 The barn is an Aladdin’s cave full of wonders which can be used for weddings, from glass jars and lanterns to ladders and genie bottles! Claire is a straight talking, enthusiastic, down to earth lady. When Sophie gave her the budget, Claire came straight up with some great ideas and suggestions. She really has great taste and knows best, and was able to tell them when she thought that some of Sophie’s ideas weren’t quite right, which they thankfully appreciated!! The bride’s bouquet and the bridesmaid’s posies, were hand–tied bunches of white scented David Austin roses, pale blush pink rose ‘Bombastic’, sweet scented ivory tinged blush pink tuberose, lime green and white chintz, fluffy pale pink Astilbe, little green rose ‘Blanchette’, inky black Myrtle Berries and white Gypsophila. The exquisite buttonholes and corsages repeated the flowers in the larger bouquets, as did the Gypsophila sprigs in the bridesmaids’ hair. As Sophie and Chris have always enjoyed their cocktails. a good gin for her and a nice bourbon for Chris, they came up with the idea of using spirit bottles as vases for the tables. This in turn then created the table names, (and gave them the perfect excuse to drink ten bottles of lovely spirits in during the wedding planning!). They chose Hendricks for the top table and other table’s names included some unfamiliar names such as Monkey Shoulder, Ophir and Mezcal. On the morning of the Wedding day, Claire herself delivered the bridal party flowers to the house. She then took the table flowers to the venue to set every thing up. It was really special to step into the tipi after the ceremony to see everything in place and looking just perfect. The table flowers beautifully echoed the bouquets. What a lovely surprise! Sophie threw her bouquet into the her girlfriends – I’m not saying who caught it, but lets wait and see if the old saying comes true!! I asked Sophie how she added personal touches and elements to make her wedding unique. 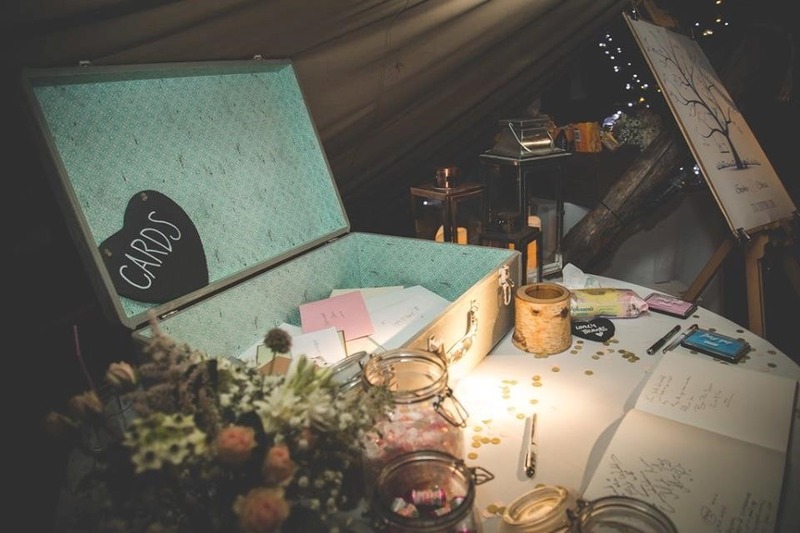 “We borrowed a vintage suitcase from our kind friend and celebrant Carrie Ann, to put our cards in. Chris designed a picture of a tree which balanced on an easel borrowed from Kloe which all our guests could put a thumb print on. This is now in our hallway and a lovely reminder of everyone celebrating the day with us. As a celebrant, I will perform your ceremony in the venue of your choice. You may have a place that is special to you, or need help in deciding and choosing. WhiIst my focus will be on creating the perfect ceremony for the bridal couple and their guests, I am more than happy to offer my experience, advice and guidance across all the different elements, of your special day, including, of course the all-important flowers. In next week’s post, I will share with you Sophie and Chris’s choice of music, film and photography and look at the important part they played in shaping and creating and capturing her and Chris’s unique and wonderful wedding weekend. All pictures are reproduced with kind permission from Lionel JoJo Taplin, stealthedayphotography.co.uk.